Briefly emerging from seasonal slumber to catch up with Star Wars: The Force Awakens' box office tally before New Year. To the surprise of absolutely no one, the new movie has taken over a billion dollars at the box office. This is unprecedented in such a short time frame and suggests The Force Awakens may surpass James Cameron's Avatar as the biggest grossing movie of all time. "You almost have to rewrite all the record books for this movie," box office analyst Paul Dergarabedian of Rentrak said. "It's absolutely mind-blowing that 'Star Wars' could get to a billion dollars in 12 days and it hasn't even opened in China, the second biggest movie market in the world." "It's great for the audiences, great for studios and theater owners in particular who can point to this and say the movie theater industry is as viable and relevant as it's ever been," he said. This is my final post of 2015! 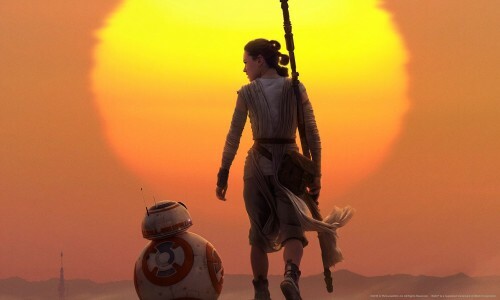 A year that saw Star Wars' triumphant return to the silver screen. 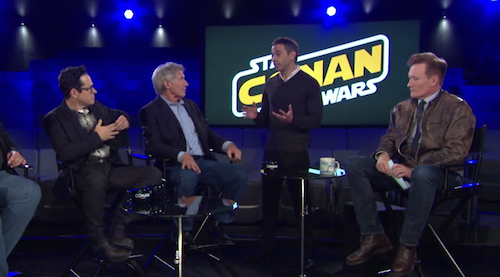 So, this hilarious skit, featuring The Force Awakens director JJ Abrams and Harrison Ford (Han Solo) on Conan, seems an apt way to wrap things up on Christmas Eve. I would like to wish you all a fantastic festive period, whatever you may be doing, and wish you all the best for the New Year! Disney's $4 billion dollar gamble on "a galaxy far, far away" appears to be paying off and then some. Star Wars: The Force Awakens is breaking box office records following last week's premiere and passes Jurassic World's global box office debut with $524.9 million. 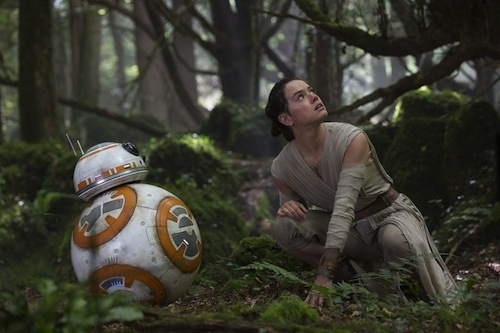 The Force Awakens has yet to open in China, which is the world's second largest movie market. 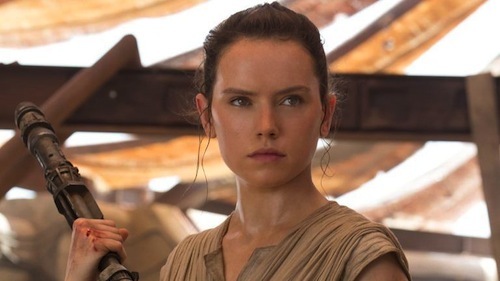 “‘Star Wars,’ I’ve said a number of times, I think is probably the most valuable, maybe even the most important mythology created in our time,” the Disney chief said. Analysts say the space saga could become the biggest-selling movie of all time. 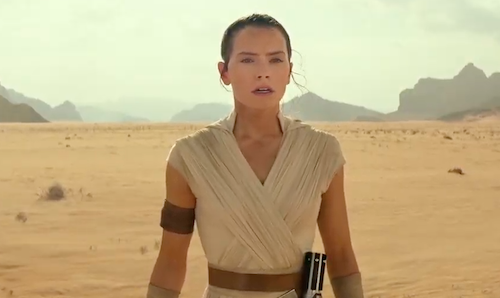 "Our sole focus has been creating a film that delivers that one-of-a-kind Star Wars experience, and director JJ Abrams, Lucasfilm president Kathleen Kennedy and the Lucasfilm team have outdone themselves," Walt Disney Studios chairman Alan Horn said. The new Star Wars movie is already available for pre-order on Blu-ray disc. This is the Star Wars movie fans are looking for. Over the summer Jurassic World took an ageing franchise and reinvigorated it into box office gold. Now, the granddaddy of them all enjoys a yuletide homecoming without equal following a ten year absence. Time enough for the prequels to fade, a change of ownership and fans to focus on events following Return of the Jedi over thirty years ago. Marvel Comics couldn't satiate my yearning to see beloved heroes in new adventures on the big screen. What happened to Luke Skywalker and friends after the defeat of Darth Vader and his Emperor? Director JJ Abrams had already captured the magic of Steven Spielberg in Super 8 and now George Lucas' saga sees him graduate into the top flight of Hollywood directors. Fresh from rebooting Star Trek. Abrams' supernatural grasp of the mythology of the original trilogy delivers spectacularly in a superlative sequel brushing shoulders with The Empire Strikes Back during its bleakest moments and equalling A New Hope. 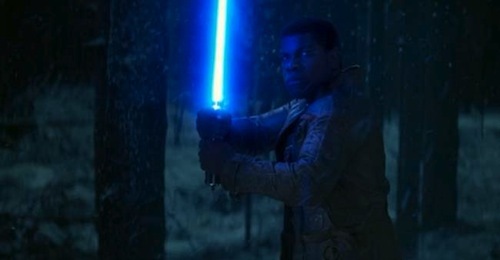 In Abrams' galactic odyssey we witness Kylo Ren's (Adam Driver) rage surpassing sulky Anakin Skywalker in the prequel trilogy and Rey's (Daisy Ridley) reluctance to fathom her mysterious past as she befriends Finn (John Boyega), a disenfranchised First Order Stormtrooper, and leaves behind life as a scavenger on the desert planet of Jakku after rescuing BB-8. 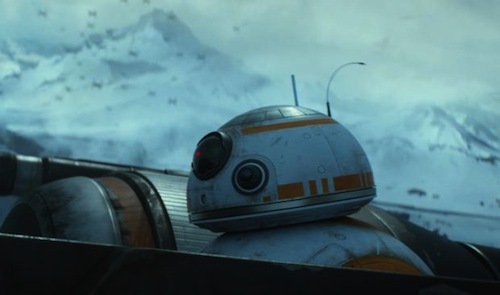 The spherical droid newcomer is truly a marvel to behold and takes its rightful place alongside R2-D2 and C-3PO. 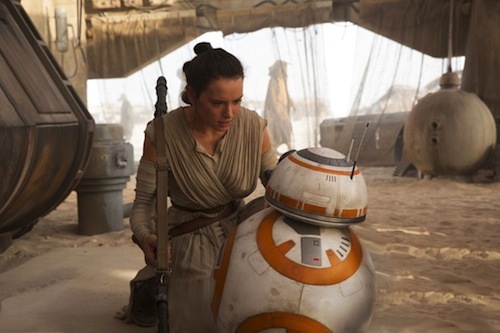 Amidst the Arthurian storytelling and beguiling vistas shot on Kodak film, John Williams' sweeping soundtrack for The Force Awakens is triumphant. More than once it prompted bittersweet feelings of nostalgia at seeing Star Wars for the first time with my late mother. A transcendental experience in the wake of childhood trauma in 1977. Star Wars hadn't opened in the UK when I was admitted into children's hospital following a serious head injury. But, I remember the American neurosurgeon - who saved my life alongside a talented team - saying I had to promise him I'd see Star Wars and gave me a poster of R2-D2 and C-3PO as a parting gift! The promise was kept. 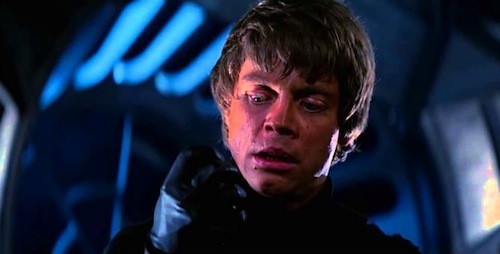 What of Luke Skywalker's fate? That's for fans to discover for themselves. 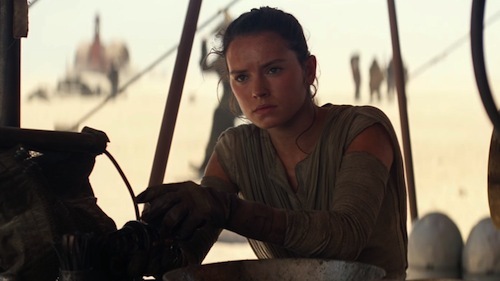 The old and new cast shine with charisma and Daisy Ridley, beautiful and effervescent, carries the movie with an aplomb belying her freshman acting career. The sight of a squadron of X-Wings was met with whoops and cries of delight. Thank you for an incredible Christmas gift, JJ! Today the review embargo for Star Wars: The Force Awakens is lifted and critics are raving about JJ Abrams' Star Wars movie and how it harkens back to the original trilogy whilst keeping a keen eye on the future. The Times critic Kate Muir wrote: "Adults will be floored by tearful nostalgia because this is a classic." 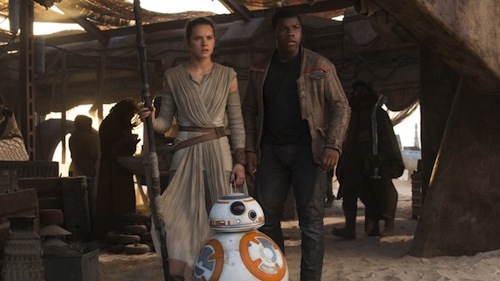 The Daily Mail's Brian Viner described The Force Awakens as "a triumph of escapism and the most exhilarating film yet in this mighty franchise." 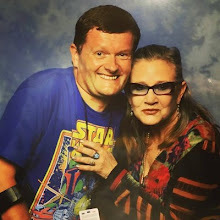 The Telegraph's Robbie Collin, who admitted to crying three times, said director JJ Abrams and his team had "taken a slightly tattered franchise and restored its sense of magic and myth." We’re on the home stretch for the sequel to Return of the Jedi. 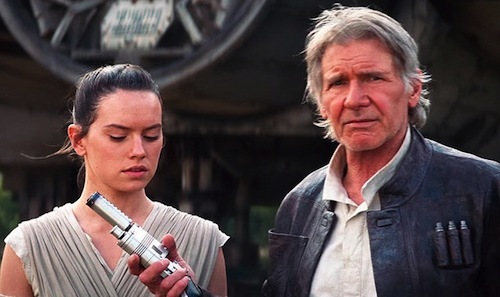 The Hollywood premiere of Star Wars: The Force Awakens is today. 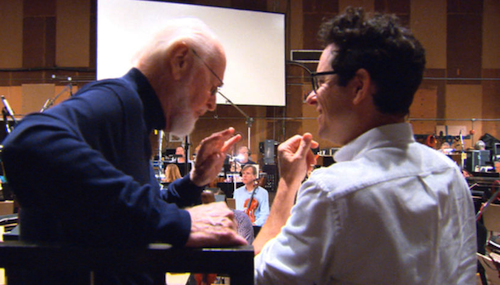 60 Minutes, on CBS, went behind the scenes of the recording of The Force Awakens soundtrack, composed and conducted by Oscar-winning composer John Williams. The music featured includes a tantalising tease of the cue that follows the famous opening crawl. So, please consider this a spoiler warning for the following clip. Director JJ Abrams shares anecdotes between capturing moments, from the recording session, on an iPhone. Steve Jobs would be proud. Historically, I've always listened to the soundtrack months ahead of a new Star Wars movie's release in the UK. 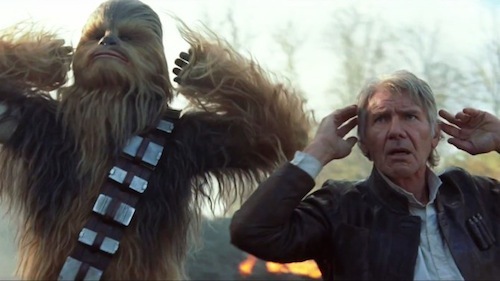 However, this time I'll have to listen to the soundtrack after seeing The Force Awakens this Thursday. With only two weeks to go until Star Wars: The Force Awakens opens in UK cinemas, Rolling Stone magazine goes behind the scenes of JJ Abrams' space opera and hints at the possible plot of the movie. "The world is so horrible," says Mark Hamill, Luke's closest earthly representative, sitting in the shadow of swaying trees in his rather pleasant Malibu yard. At 64, Hamill is older than Alec Guinness was in the first Star Wars, and is in the process of regrowing a distinctly Obi-Wan-ish beard. "Between the Middle East and gun violence and global warming and racism, it's just horrible. And people need this. It's therapeutic." 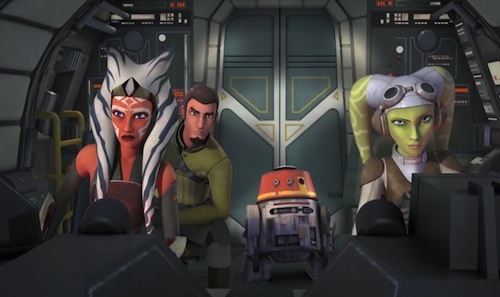 Ahead of the release of Star Wars: The Force Awakens in cinemas this month, Disney's announced news that will delight fans of Star Wars Rebels on Disney XD. A third season is already in production for broadcast in 2016. Marc Buhaj, Disney XD's senior vice president programming and general manager, made the announcement, "We are proud to bring our audience a third season of 'Star Wars Rebels,' a series that has resonated across generations." Buhaj added, "The creative team behind the series continues to do a brilliant job in delivering on the key tenets that fans have come to expect from a Star Wars property, including adventure, hope and the battle between good vs. evil." "We're very proud of our incredibly creative Rebels team," says Lucasfilm's senior vice president of development, Kiri Hart. "The show continues to tell fun, heartfelt, exciting new Star Wars stories week after week, and it's beloved by fans of all ages. Season three will see our Rebel heroes face new obstacles and find new allies in their fight against the Empire." Following a series of critical events, the lives of our heroes will be changed forever as season three begins. Star Wars fans know all about waiting. But, The Force Awakens is released in cinemas this month. There, I've said it! Over the years and thanks to the explosion of online video in the past decade, fans have collected, catalogued and screened all sorts of ephemera around Star Wars. Whether it’s old adverts for Kenner Toys, spin-off TV movies, cartoon series, radio dramas or BBC documentaries, there’s an awful lot of content out there about the making-of, marketing and magic of George Lucas’ movies. That’s what I’m presenting with 30 Days of Star Wars a collection of all the ‘stuff’, usually found on TV, that sat around the original trilogy for the past 30-odd years. I wanted to create a sort-of Advent Calendar for fans to enjoy as the time ticked away (oh so slowly!) until the new movie premieres. I’ve focused on the Original Trilogy because there’s a wealth of archive material to draw upon and of course, those characters are back. None of the material is uniquely uploaded by me, but I thought that 30 Days of Star Wars could act as a hub for collecting some of this content together. I also enjoy researching where items came from and who was behind them. 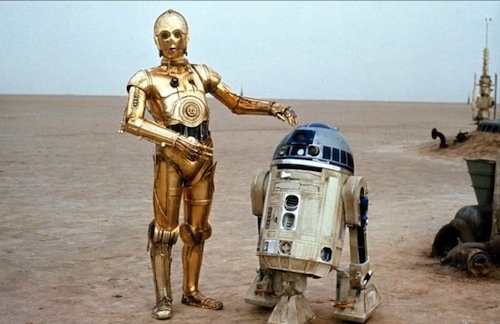 For example raw footage of R2-D2 and C-3PO on ‘Sesame Street’ is not something you see every day. Or Big Bird messing-up his lines, come to think of it. Occasionally there’s also a rare glimpse into the mind-set of what may happen in future Star Wars movies. I mean, you guys all knew there was a character in the ‘Droids’ cartoon series from the mid-eighties named ‘Kybo Ren’ right? Coincidence? Time will tell!